Your Quilting Table and Chair - Choose the Best for YOU! Your quilting table and chair have a major impact on how much you like machine quilting. If you just aren't comfortable or it down right hurts when you quilt, then you won't practice. And practice is what it takes to be a good quilter! Fortunately, it doesn't have to be painful. You sit directly in front of the needle. Seems like a lot to remember. Really it's not, because your body will help. Your body is telling you, or rather yelling at you, that you aren't in a good position. Reliably sitting in a good, comfortable position is what finding the proper table and chair is all about. 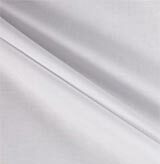 It will help make quilting fun! Honestly, you can get away without one for piecing; however, once you start quilting your own quilts you'll be so glad you have it! Support the weight of the quilt, thereby taking the strain off your hands and fingertips. A quilt hanging off the bed of your machine is much harder to move and manipulate than one supported completely by a horizontal surface. Provide ample space to position your hands. You'll focus on guiding the quilt instead of where to put your hands. The bed of your sewing machine as it sits on a table top is only barely big enough for the simplest of ditch or straight line quilting. Since there is no real space for your hands, free motion quilting is nothing but a chore. The bed of a table top sewing machine is just not large enough to comfortably, confidently quilt on. I know, because that's how I started. If you don’t own a cabinet that your sewing machine sits down into, an 18"x24" (or larger) acrylic sewing table is a MUST for quilting. 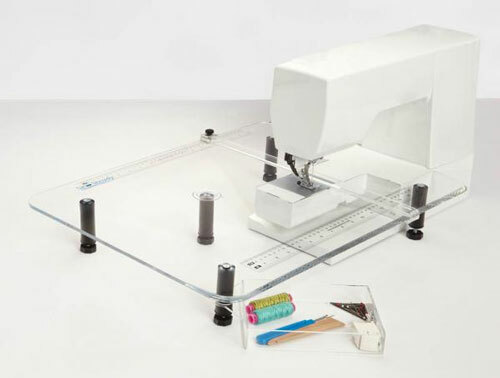 These types of portable tables, like the Sew Steady shown to the above, can be ordered from your local quilt store or purchased online. I recommend you DO NOT order one smaller than 18"x24". There's just not enough room to put your hands while you move the layered sandwich under the needle. 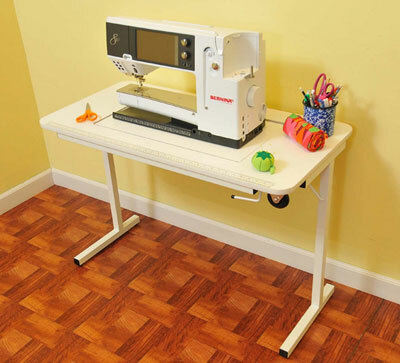 Click here to check out reviews and/or purchase a Sew Steady table from Amazon.com. Is it stable? Does it vibrate during quilting? Is it high/low enough? These tables are generally 28" to 30" high. Can you position your chair so you sit directly in front of the needle? Craning you neck to accommodate for a poorly designed table causes neck fatigue. Is there enough room out to the left of your machine? Many of the smaller tables are centered in the cabinet. If you have a machine with a longer arm, there's virtually no room on the lefthand side. Nice, but not necessary is a gate-leg extension off the back of the table. You won't need any extra tables behind your machine for quilting. And when it's not needed, it folds down and out of the way. A non-portable quilting table can range anywhere from about $400 on up, depending on the size, features and the material it's made from. If you choose a smaller quilting table, you need to put additional tables out to the left and to the back of it when quilting. 60"x30" folding tables will cost at least $50/ea and probably more. Figure this into the calculations for the cost of your quilting table. If a full-fledged table isn't possible, another alternative is a portable sewing table like the Sew Ezi (which I own) or Sew and Go (pictured right). They provide enough space for your hands during quilting. They retail for usually under $300. Another alternative, if there's a carpenter in your family, is to build your own. Plans are available from Keepsake Quilting for a large 6'4" by 4' table as shown to the right. Just like a traditional cabinet, you'll need a dedicated space for it. However, building your own gives you the option of customizing it to your specific needs. Always a good thing! An adjustable chair that can be raised and lowered is a necessary addition to your quilting studio. Sitting too low while quilting can leave you with pain between your shoulder blades. That limits your quilting time. Sit high enough over you work and you'll find you can stitch until the machine gets too hot. Is it easy to raise and lower easily? Does it raise up high enough? And stay there? If it's on wheels, does the chair have 5 legs? 5 is way more stable than 4. If you're on carpet you may need a carpet protector. Can you adjust the chair back? Is it easy to do? And finally, is it comfortable for YOU? If you're on carpet and the chair has wheels, get the plastic carpet protector for easier chair movement. If you assembled the chair yourself, keep the instructions and any tightening wrenches handy. This chair's going to get a lot of use. You probably have to tighten the screws a time or two. Ceiling light is rarely enough. I use two to three movable lights for quilting. Two are Ott lights. When you are free motion quilting "as you go" (nothing is marked) and your thread matches the fabric, it's difficult to see your previous stitching. It's useful to put the light exactly where you need it. When you get into machine quilting, it's hard to stop and take a break. Keep a big glass of water at your workspace AND drink it! Mother Nature will help you get up. When you get up, focus on something across the room so your eyes change focus. Stretch out your shoulder and neck muscles with a “Yes-No-Maybe” exercise. The key is to make slow, controlled movements to gently stretch and loosen the muscles you've been clenching as you stitched. Shrug your shoulders (like your kids do when they say "I dunno!") as high and as low as comfortable. Simple! Your upper body tingles as the blood circulates. It feels so good! Again, take the movements only as far as is comfortable. Remember, we're quilters stretching a bit, not marathoners getting ready for the big race! Finally...BREATHE! For some reason, we tend to hold our breath as we quilt. Choosing the correct quilting table and chair goes a long way towards being good to your body during quilting. Listen to your body. If something hurts…then something is wrong. Change positions, take a break, but listen to your body. 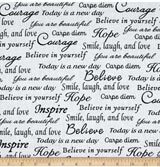 You want to be a happy quilter! If you can have only one in your library...this is it!